The post office’s old flagpole was fabricated 60 years ago by L. Ph. Bolander & Sons, a San Francisco company established in 1881 and still run by the Bolander family. They had the only lathe in Northern California that could have made the 16-foot Douglas fir flagpole, according to Crane. Crane said he named his business ANC so it’d be listed ahead of Bolander in the phone book, but insists the two businesses are on friendly terms. Crane has been in business for a mere 49 years. 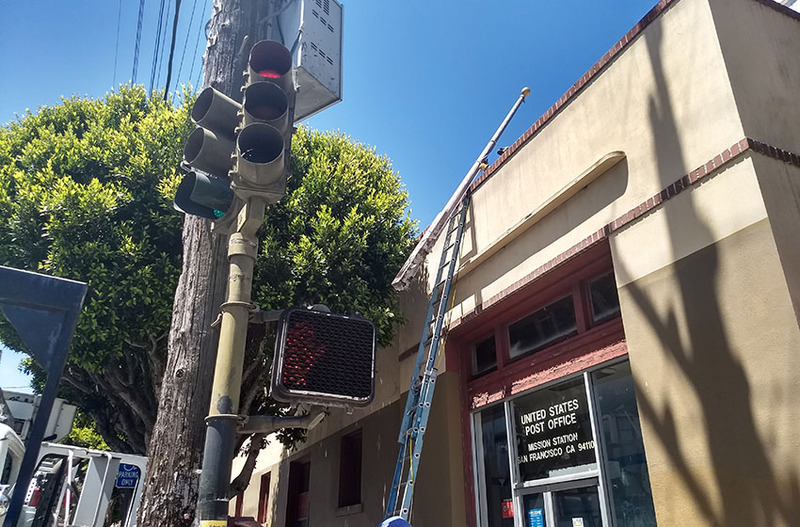 The old flagpole is removed from the roof of the Mission post office (23rd Street). Photo by Jay Martin. In the middle of the job, a crew member lowered a rope from the roof. Crane deftly tied a wrench to the end and jokingly called the knot a firefighter’s half-hitch. Firefighters use an uncomplicated knot that is easy to untie in the smoke, he said. Crane was a firefighter in the Pittsburg-Antioch area who retired after an injury. He helped fight the Oakland Hills fire in 1991; after that, he wouldn’t take his crane business to construction jobs in the Oakland Hills. “I can’t make money on other people’s misery,” he said. 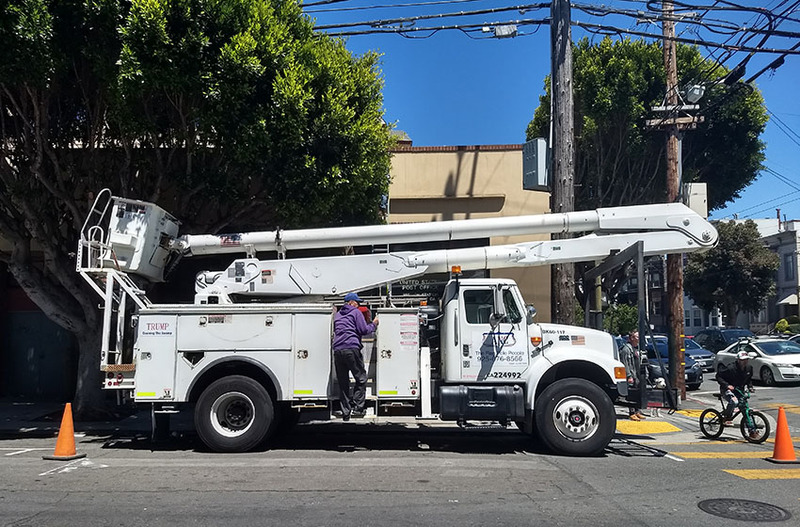 On Sunday, while wildfires burned in Redding and ideologies clashed in Berkeley, everything was ordinary at the corner of South Van Ness and 23rd Street in San Francisco. 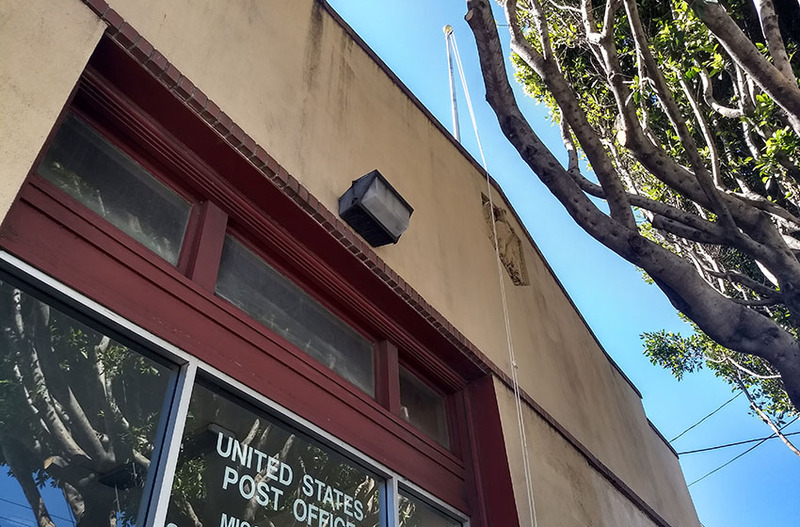 A flagpole wore out, a professional replaced it, and on Monday morning a postal worker would raise the U.S. flag over a U.S. post office and deliver mail. What happened to the old flagpole? Chuck Crane asked me whether I wanted it. After telling me its history, he didn’t seem to want to cut it up. I didn’t want to say no. I said I knew a park it might go to someday. Full disclosure: The old flagpole is currently in my backyard. The new flagpole on the Mission post office. Photo by Jay Martin. I went to school with Larry Bolander who I assume is Larry #4. I took a few trips with his family to Monterey. That was my first experience with fresh abalone that Larry #3 harvested. They lived in Pacifica and had a giant flagpole in their backyard that was visible everytime you drove into town on highway 1.